Well, in keeping with my Autumn theme I thought I’d review my Laban Mento (Medium) in Autumn Flake. I hope you all find this useful. Literally, my first impression of this pen was ooooooOOOOOOOooooooo! This pen is huge, huge I say… and shiny. After I settled down from the shock of it all, I took a closer look at it. This pen is very pleasing to the eye. It’s torpedo shape is appealing, but, the trim is a bit cheap looking. The clip is simple and straight with a ‘L’; at the top. The cap band is equally simple with ‘Laban’ written across it. 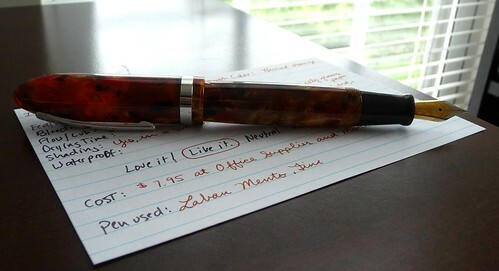 The acrylic used for this pen is very nice. It’s striking, provides great depth of color, and is highly polished. I have the Autumn Flake pattern. The background is an iridescent golden caramel color flaked with bits of red and black. The size is really what sets with pen apart. The only thing I can compare it to is a Mont Blanc 149. Several weeks ago I was at a pen store and got a chance to see and hold a Mont Blanc Diplomat. That is indeed a massive pen. The Laban feels nearly as large and perhaps a bit longer. This pen is about 6" capped and nearly 6 3/4" with the cap posted. The nib is large at about 7/8", but not as large as the MB nib. I have the diameter of the barrel at around 5/8" at its widest point. The large size of this pen makes it very comfortable to hold and write with for long periods of time. This pen is not very heavy. I have the weight at just about 35 grams (including converter and ink). It is very comfortable to hold. My pen has a fine steel nib. The line width is actually a bit finer than a western fine. With nibs this fine (and in pens this inexpensive) you kind of expect the nib to be a bit scratchy. Well, it isn’t toothy or scratchy, but it does give a bit of feedback while writing. I prefer a little feedback, but this is just a bit too much for my liking. It gets the job done, but I’d prefer something a touch smoother. I’m considering getting a medium nib for it. I have a hunch that a the Medium would be smooth like I like it. Reviews elsewhere have commented on the smoothness of the medium. 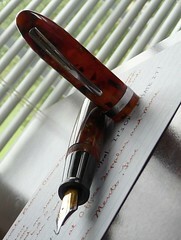 I believe Todd at isellpens sells the nibs separately. Well… it’s a cartridge/converter system. It works just as it’s supposed to, but this is not my favorite filling system. One benefit is that it takes regular international cartridges instead of some obscure proprietary cartridges. More than likely I will just use the supplied converter. This pen would make a great ED if it wasn’t for that small hole at the end of the barrel and the metal threads. I suppose if you find a way to plug the hole you could use it that way, but I wouldn’t bother. You can find these new online for around $70. I got this one from a fellow FPN member at about half that price. 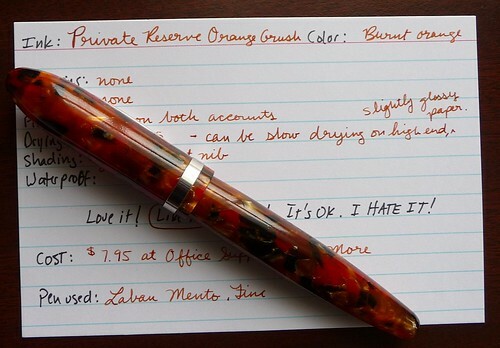 At $35 this pen is an excellent value for the money. You get a pleasing design with several beautiful acrylics to choose from. In addition, you get a pen that is quite huge and comfortable to hold. All in all, I’m happy with this pen and can definitely see it getting lots of use. 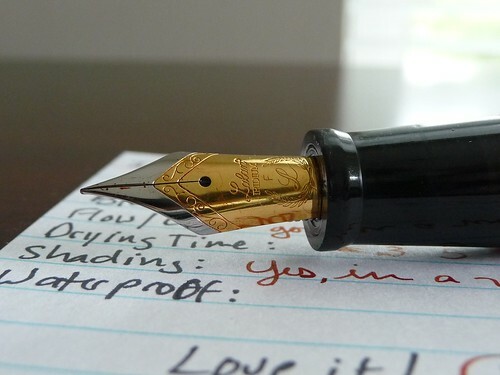 I’d definitely recommend this pen to anyone who is looking for a huge pen at a modest price tag; however, I would not pay over $50 for this pen unless it is really calling your name.